The UPA has claimed the Right to Fair Compensation and Transparency in Land Acquisition, Rehabilitation and Resettlement (LARR) Bill 2013 passed by both Houses will reduce forcible acquisition and help tackle Naxalism in mineral-rich areas. But with Coal Bearing Areas Acquisition and Development (CBA) Act 1957, Land Acquisition (Mines) Act 1885, and Damodar Valley Corporation (DVC) Act 1948, along with 10 other laws, exempt from the land Bill, the Central government has its own acquisition in mineral-rich areas such as Jharkhand out of the law’s purview. “Almost 85 to 90 per cent acquisition — over 20,000 acres — is on under these Central laws and for highways and railways, exempt under the land bill. Only around 4,000 acres being acquired for public-private projects and State projects will come under land Bill,” said a senior revenue official. Jharkhand holds nearly a third of India’s coal, a quarter of its iron-ore, 16 per cent of copper, and is rich in cobalt, bauxite, uranium, manganese, limestone. In a 2009 paper, economist Dr. Ramesh Sharan noted that between 1951 and 1995, industrial and mining projects displaced over 3.34 lakh persons. Massive public resistance against the Koel Karo dam and the army’s field firing range in Netarhat that threatened to displace another three lakh — over 87 per cent of whom were tribal — forced the government to withdraw the projects in the 90s. The Chotanagpur Tenancy Act enacted in 1908 after the Birsa movement was meant to protect tribal land by restricting sale of Adivasi land to non-Adivasis in 16 of Jharkhand’s 24 districts. But in 1996 it was amended to allow use of tribal land for mining and industry — a provision that will continue under the land Bill. The Panchayat Extension to Scheduled Areas (PESA) Act, 1996 has provisions allowing the gram sabha to be consulted before acquisition of land in Scheduled Areas for developmental projects. But this was not incorporated in the Jharkhand Panchayat Raj Act 2001, leaving gram sabhas with no effective say in public or private acquisition — a situation that will remain unchanged under the new Bill. In recent years, several private companies have opted for purchase from farmers and tribals in mineral-rich areas on terms that have sometimes provoked resistance for years afterwards where farmers found themselves cheated by middlemen working for the company. But in instances where the land is purchased and not acquired with the State government’s help, as in the case of public-private projects (PPPs), the provisions of LARR Bill do not apply. 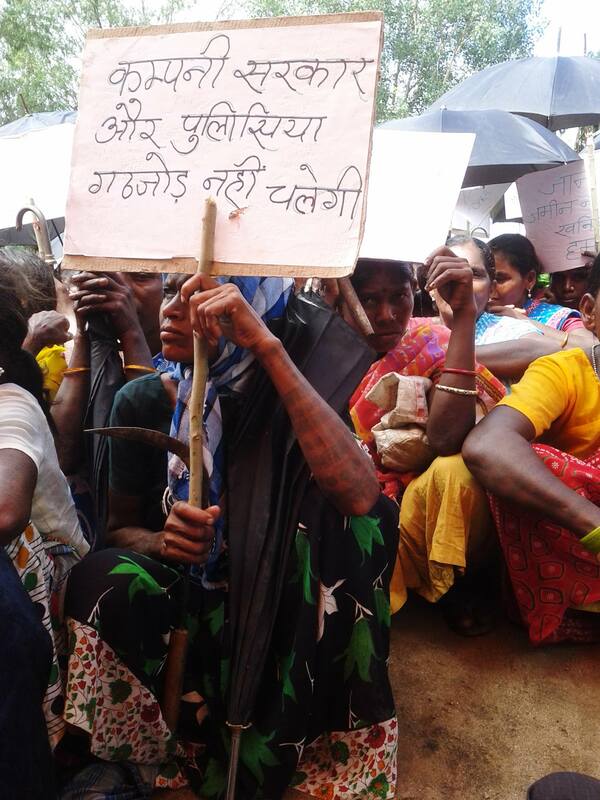 Among recent protests against land acquisition, one of the most violent was in Keredari in Hazaribagh, 125 km from Ranchi, where the National Thermal Power Corporation (NTPC) is acquiring land to mine coal. More than 10,000 families in 23 villages are opposing the acquisition. A section of the villagers have demanded Rs.25 lakh and a job, instead of the Rs.10 lakh and Rs.3,000 annuity offered by NTPC. On 23 July 2013, when NTPC contractor Pradeep Singh began work on a 0.42-acre plot at Pagar village, over 200 farmers gathered to stop him. Facing hostility, the contractor’s son, Vikas Singh, hit a villager on the head with an axe before calling the police for help. Six policemen arrived and fired eight rounds into the crowd. Fifty-year old farmer Keshar Mahto died on the spot. The bullets injured three others. Villagers surrounded Keshar Mahto’s body at Keredari chowk till midnight, refusing to allow it to be taken away by officials. Speaking on the land Bill in New Delhi on September 8, Minister for Rural Development Jairam Ramesh referred to the Keredari police firing as an instance of forcible acquisition by PSUs that has worsened conflict in Maoist areas. Ironically, NTPC is acquiring land for mining coal under the CBA Act 1957 and the land Bill will not apply. According to data submitted by NTPC to the Revenue Department, 82 per cent of the land for NTPC’s coal mining — 5729.36 acres in Keredari, Chattibariatu, North Karanpura, and Pakri Barwadih — is being acquired under the CBA Act, and the rest — 1,255 acres — under the Land Acquisition Act, 1894. Will different rules for consent and rehabilitation then apply in the same project’s affected areas? Will a farmer whose land falls under two projects where different laws apply accept varying compensation? The Bill sets a base for norms of consent but exempts acquisition by PSUs in its current form. Section 106 (3) of LARR Bill 2013 says that within a year from the commencement of the Act the government may allow LARR’s provisions of rehabilitation to apply even in acquisition under the 13 laws that are currently exempt, though this will be subject to Parliament’s approval. But why has the government decided to wait a year to even consider this? “This government hands out Forest Rights with one hand and with the other it orders an industry be built on the same land. It offers 35 kg food grains, and then with the other hand it takes away land which is feeding us,” says Deepak Das (34) a political science graduate who leads the North Karanpura Bachao Samiti and is an accused in four cases related to land acquisition protests in Hazaribagh, including for stealing blankets at a NTPC’s public hearing in 2007. The Bill has special provisions for land inhabited by SCs, STs; provisions restricting acquisition of land in excess of requirement. It discourages acquisition of multi-crop and irrigated land, and makes consent of 80 per cent of affected persons mandatory. All of these could be especially meaningful in Jharkhand where only 15 per cent of the land supports multi-crop farming but there is no protection to farmers and tribals from such land being acquired. Intervening in the debate in the Rajya Sabha, Sanjiv Kumar of Jharkhand Mukti Morcha, Congress’ coalition partner in the State, said if the Bill was implemented in its current form the people of Jharkhand would forgive neither the Congress nor the JMM. He cited how the Steel Authority of India Limited had acquired 34,000 acres for its steel plant in Bokaro — 22,000 acres in excess of its requirement. The land Bill is meant to discourage such imbalances but it will allow PSUs to continue to squat on thousands of acres of land that could be used to resettle displaced persons or to give land to the landless. Soon after the bill was passed, Jharkhand Chief Minister Hemant Soren, speaking at public meetings in Dumka, Ranchi and New Delhi, cited how Coal India Limited (CIL) — the world’s largest coal mining company with revenue of over Rs.62,000 crore — owes Jharkhand government nearly Rs.3,100 crore as rent for 24,372 acres acquired since 1971 in four districts alone. “These companies have ruined arable land in Jharkhand. They treat it as if it were the bone left after the meat is chewed off. Companies are supposed to fill the land after they have mined ore or coal but they do not do this. That is why land in coal-bearing areas like Dhanbad collapses frequently,” remarked a top official in the State government. Central government subsidiaries such as NTPC and CIL have their own rehabilitation policies but have a poor record inf implementing these. Moreover, such policies are not enforceable in the way that LARR’s provisions will be. One of the massive land acquisitions on in Jharkhand now is by CIL subsidiary Central Coalfields Limited (CCL) for its Magadh-Amrapali-Pachra project in Tandwa in Chatra, central Jharkhand. CCL plans to acquire 17,141 acres of land to triple production from 48 MT annually to 127 MT by 2015. Tandwa lies by the River Damodar. Land all around the town is pockmarked by coal-mines abandoned by CCL and DVC. On August 26, the Jharkhand High Court directed CCL to remove a causeway it built using coal waste, blocking the river. 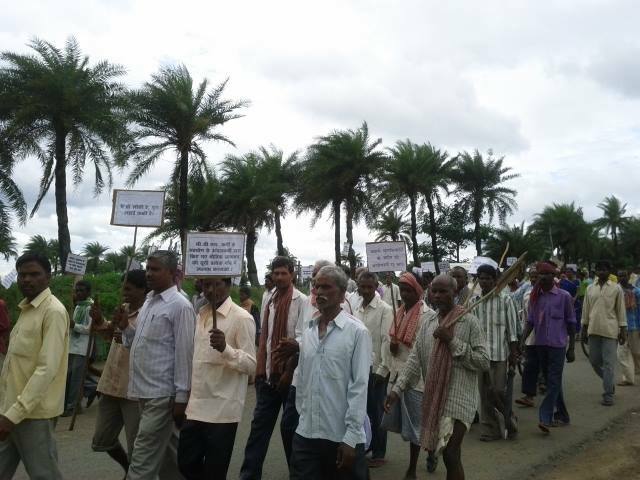 On September 19, Adivasi and Mahadalit marginal farmers staged a six-hour protest in Tandwa against CCL’s acquisition. Several of these families cultivate plots of less than one acre in villages around Tandwa on land redistributed after the land ceiling Act. 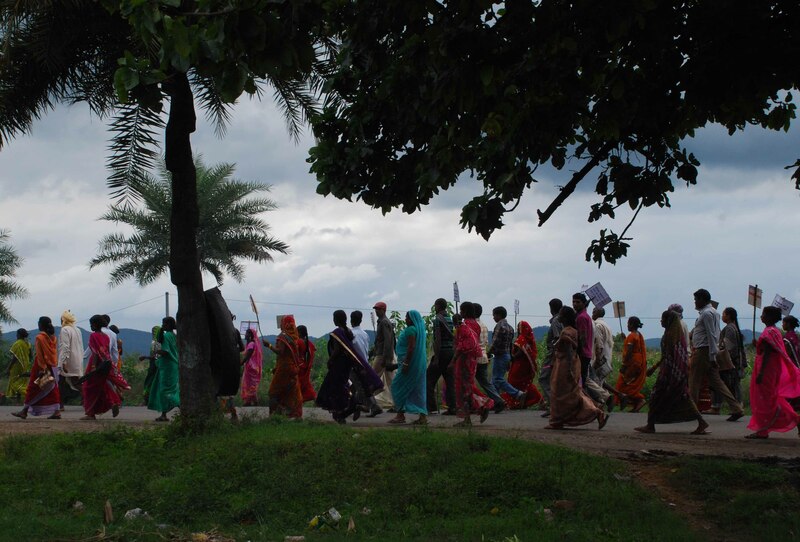 “The neechi jaat [lower castes] are refusing to give up land,” remarked Anita Devi from the trading community in Tandwa as she watched over 500 men and women march to the Block office carrying their traditional weapons and sickles. “This land gives us paddy, corn, gram, vegetables. We will not give it up,” said Birsi Devi, a tribal from Ursoo village. The land Bill mandates the claims of such marginal and small farmers and tenants be recognised. But as this large-scale acquisition of coal areas too is under CBA, the land Bill will not apply. This article appeared in The Hindu here. A report on police firing at farmers protesting NTPC’s acquisition in Keredari in Hazaribagh here. On March 29, in one of the worst setbacks the Maoists have suffered in Jharkhand in recent months, cadres of the Tritiya Prastuti Committee (TPC), a splinter group of the banned CPI (Maoist), killed 10 Maoists after a gun battle that lasted over 10 hours at Lakarmanda village, 17 km from Kunda, where the Maoists had stopped en route to Gaya. The TPC took 25 Maoists hostage for four days in the Sarengdah and Kunda panchayats in Chatra district and released them after sending off photos to the press of the captured Maoists. “We kept the hostages in a village school. We have released 12 cadres and some of their families came to take them from Chatra and Bihar. We kept 13 back. This is our area and the Maoists cannot enter it,” said a close aide of TPC founder Brajesh Ganju in Sarengdah. Another member said they had reports that the police had since arrested two of the 12 Maoists released by the TPC on Tuesday. But the police denied the claim. “The Maoists are ugravaadi [militants]. The TPC has resolved to finish off Maoist militancy here. We have no enmity with the police or paramilitary forces, we will support them against Maoists,” said Mr. Ganju’s aide. In a statement, the Maoists alleged that the police and their “vigilante group” TPC had cooperated in carrying out the operation. “We resolve to avenge the death of the People’s Liberation Guerrilla Army martyrs,” Bihar Jharkhand North Chhattisgarh Special Area Committee spokesperson Gopal said, calling a Bihar-Jharkhand bandh for April 6 and 7. The TPC was founded in 2001 in Chatra by Brajesh Ganju, a Dalit, who had left the Maoists Communist Centre (MCC), citing the dominance of Yadavs in the party leadership and discrimination against Dalits. The TPC, which has cadres from Dalit communities including Ganju, Turi and Bokta, is active in parts of Chatra, Palamu, Latehar, Ranchi and Hazaribagh districts in Jharkhand and parts of West Bengal. “Caste is not the main factor anymore. Initially the feeling was that gains and funds were going to one caste group though everyone worked equally hard. But we have cadres from all castes, including Yadavs,” said a supporter in Chatra, a Dalit, who has helped the group with logistics since its inception and now works as a contractor building the panchayat bhavan building in the area. While officials had denied taking TPC support in the operation against Maoists in Chatra, deep inside the forest at Lakarmanda in Kunda eyewitnesses said they watched TPC men handing bodies of the Maoists to the Commando Battalion for Resolute Action (CoBRA) troopers who arrived in their village on Thursday morning.